Every morning at sunrise, dozens of colourful hot air balloons fill the sky above Cappadocia, Turkey. I first learned about Cappadocia while scrolling through my Instagram feed and immediately became obsessed with going there! Hot air balloon trips run all year round in Cappadocia (although there is a higher cancellation rate during the winter). I recommend spending a few days in the area and booking your balloon ride for your first morning as occasionally flights are cancelled due to wind conditions. A couple of months before the trip, I booked the Royal King flight with Royal Balloon, which includes 90 minutes in the air. At that time, the passenger limit on this particular flight was 16, but it has since been reduced to 10. After a flight from Istanbul to Kayseri Airport we took a shuttle bus from Kayseri to our hotel, arriving around midnight. On a whiteboard in Sultan Cave Suites’ lobby, pickup times for hot air balloon rides were written. Our hot air balloon ride was scheduled for 4:45 am- just a few hours away! I was so excited that I barely got any sleep that night. A white van from Royal Balloon picked us up and dropped us off at the company’s headquarters. We were invited to eat a buffet breakfast while the pilots waited to hear whether the Civil Aviation Authority would say if it was safe to fly. After being given the all-clear, we took a shuttle bus to the launch point. The location of the launch point varies every day depending on wind conditions. When we reached the launch point, it was still a bit dark, and stars were sparkling in the sky, making the experience more magical. There were several balloons nearby and crew members were filling them up with air. The balloons flickered with puffs of fire from their burners. Soon, our balloon’s basket was flipped over and we were invited to get in! The balloon was divided into five sections- four squares that fitted four people each as well as a space in the centre for the pilot. Our pilot, Nigel, who was from England, explained some rules to us and we all practiced the brace position for a crash landing. After that he fired up the burner, and the balloon started to lift off. Since I’m afraid of fire, I initially felt scared of the flames from the burner, but as the balloon rose into the sky, all my fears floated away. The view was breath-taking! Riding in a hot air balloon was such a peaceful feeling. The ride was so smooth- just like floating in a pool. Nigel spoke to his colleagues over the radio. They were keeping each other updated on their surroundings, warning each other if there was another balloon above or below them. He also pointed out interesting landmarks to us as our balloon drifted along. 90 minutes flew by, and it was time to begin our descent. Nigel spoke with the crew on the ground, planning where to land. As we descended, I could see the ground crew waiting for us in a field. Nigel landed the balloon perfectly on a trailer and soon after we all climbed out of the basket. It was very interesting to watch the ground crew deflating the balloon. All spread out on the ground, the fabric of the hot air balloon looked like a giant blanket! Next, we had a post-flight celebration where we were served champagne and awarded medals! We were also given Royal Balloon T-shirts. -Pickup/take-off time varies according to the sunrise time. -Even during hot months, bring a light jacket for the hot air balloon ride as it is still a bit chilly in the morning, especially so high above the ground. 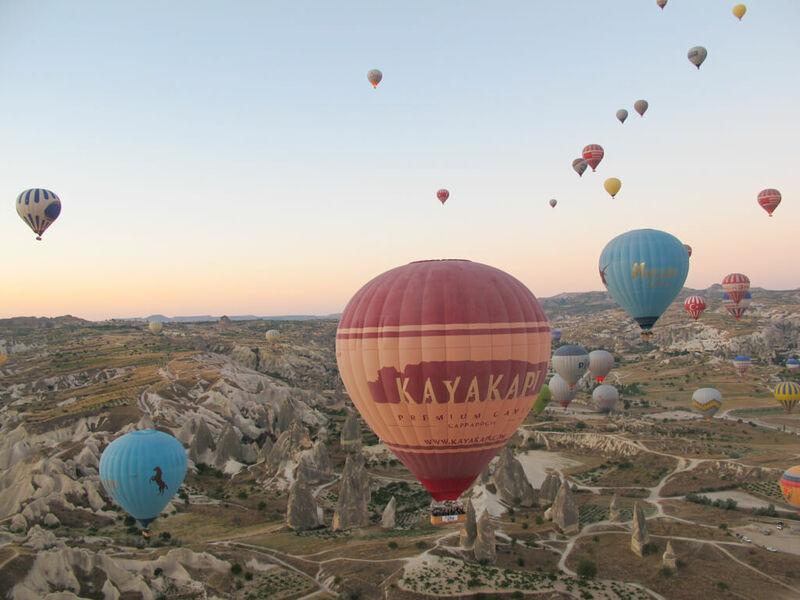 -There are many hot air balloon companies in Cappadocia, and some of them offer much cheaper prices than Royal Balloon. However, taking a flight with the cheaper companies often means no breakfast is included, and many people are squeezed into the balloon. Also, some of the pilots may not be able to speak English, which would be a problem if you want commentary. Besides Royal Balloon, other well-regarded companies are Voyager Balloons, Kapadokya Balloons and Butterfly Balloons. Wow!!! Incredible pictures of not on the balloons, but the scenery too. I’d absolutely love to see this one day. We have a few balloon festivals near us – Colorado and New Mexico. This has motivated me to research a bit more!! Thanks. I hope you make it there someday! I have seen photos of the Albuquerque Hot Air Balloon Festival. I would love to attend it! Wow! I can’t wait to ride a hot air balloon. With all the other hot air balloons up in the air with you, it must have been a memorable sight. What a trip! It certainly was memorable! It’s a place I dream about over and over. Wow, the view is absolutely gorgeous. I remember seeing pictures on Instagram as well and wondered when I will make it there to experience this. Your pictures are amazing, the view from the top should be memorable. Thanks for sharing, I will definitely add this place to my bucket list. Oh Cappadocia! Definitely a bucket list item. I have read so many wonderful stories and seen beautiful pictures from Cappadocia, I really want to go there! I’m not so much into hot air ballooning but I would love to see the natural wonders of this place. I found out about Cappadocia the same way as you did. When I saw it on instargram I knew I have to go there one day! This place looks unreal1 I hope ill get to visit one day. Whoa! This looks just so gorgeous! The entire expanse dotted with so many colorful balloons looks so gorgeous! Great timing too! To be able to witness the sunrise from above there must be one heck of an experience! The landscape looks gorgeous too! For so long I’ve dreamed of doing this but never understood how/the logistics. Your post has really helped me understand how I might visit in the future. Thank you – so dreamy! Great guide! Now I want to visit Turkey just for this. Incredible picture with so many colorful hot air balloons in the sky. I’d totally believe you if you tell me pictures do not even do it justice! Always a pleasure reading from you. I love looking at pics from Cappadocia, it’s my dream to go there. Great photos! A hot air balloon ride has been on my bucket list for a while now and doing it for the first time in Cappadocia would be awesome! Your photographs are incredible. I’ve always wanted to look down at a landscape from a hot air balloon. Unfortunately I have never been in the right place to try it out. It seems so exciting! I reeeeeally want to do this one day!! Amazing photos and fantastic tips!